It has the potential to save employers money. It has a flexible plan design. Unspent money for claims stays in the company’s bank account. But self-funding is not like a fully insured plan. It has terms and a funding structure you need to understand in order to successfully present your quote. We know this is a lot to digest, but please read it in its entirety. Self-Funded Plans are usually reserved for the biggest employers who pay no insurance premiums but take on the full liability of employee claims. 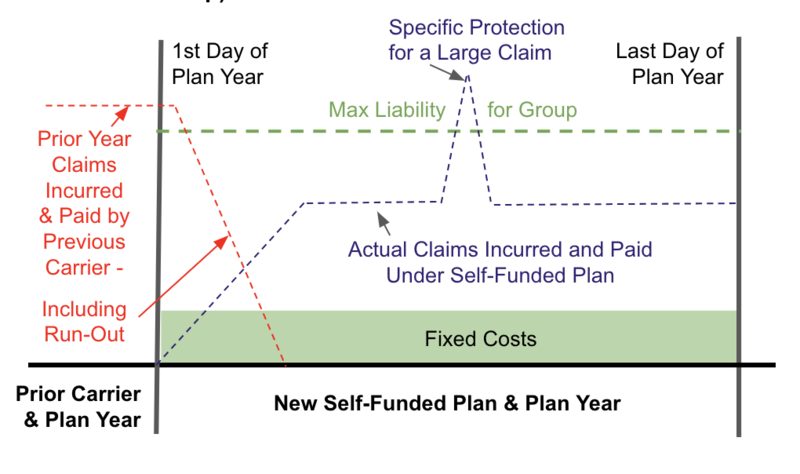 Partially Self-Funded Plans incorporate some insurance to protect the employer against catastrophic claims while the employer takes on the liability of employee claims up to a predetermined limit. Third Party Administrators (TPAs) are not insurance companies but manage the employer’s plan, adjudicate claims and coordinate insurance coverages in partially self-funded plans. They typically offer other services as well, such as management of COBRA. 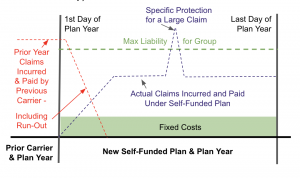 The diagram above shows the difference between traditional fully insured plans and self-funded plans. 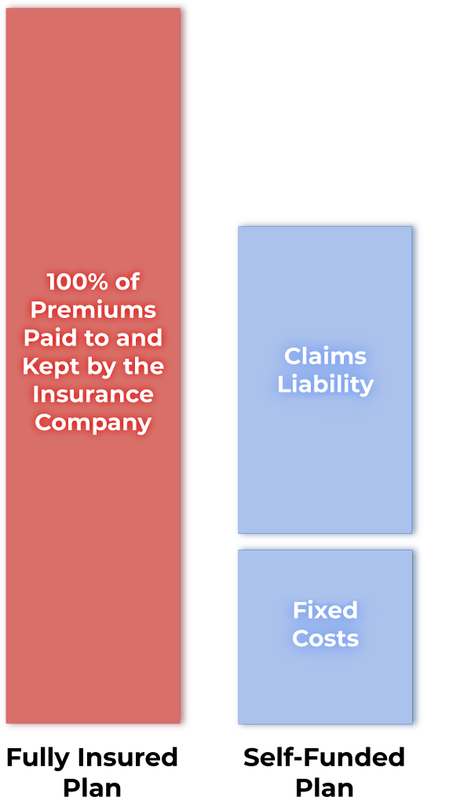 In a fully insured plan the employer pays 100% of all premiums to the insurance company, and while the insurance company is on the hook for all claims the carrier keeps the premium dollars not spent on claims. The Specific- a cap on the dollar amount of claims per individual, after which the insurance company pays all claims on that individual. The Aggregate - a cap on the employer’s liability once a dollar amount in claims has been paid on the entire group. The total of the “fixed costs” + “claims liability” = the employer’s maximum liability (or costs) for the plan year. (This is divided by 12 monthly payments with fixed costs going to pay premiums and the TPA while the claims liability portion goes in a “bank” for the employer.) In other words, even if the employer’s workforce has a horrific year in terms of health claims, the employer will pay no more than the maximum “Aggregate” liability for the year. Likewise, if any employee or family member had a high utilization, the employer’s responsibility is capped for that individual at the “Specific”. These are the two important ways employers are protected from paying too much in claims during a given year. Imagine a typical plan year for a fully insured carrier. Assume an employer of 100 with an average fully insured cost of $1,000/per employee/per month, equaling $1,200,000 per year. All of that money spent in premiums the employer will never see again. In a typical year with an MBA Self-funded plan, the amount set aside in the bank for the employer’s claims liability is not exhausted. Unlike a fully insured plan, the portion not spent on claims remains in the employer’s bank and under the employer’s control. At the end of the year employers are free to use accumulated reserves as they wish; take it back or leave it in the bank to reduce the following year’s claims liability payments. Also assume that the actual claims for the entire year equaled 80% of the total possible claims liability ($600k x 80%), or $480,000. That leaves $120,000 in the unspent bank that belongs to the employer. This is in addition to the $300,000 already saved over a fully insured plan. In this example the total first year savings is $420,000! What if the total maximum employer’s exposure (fixed + max claims) is not 75% below a fully insured plan? What constitutes a “large group”? What employers are suitable candidates for self-funding? Typically a large group is defined as 50+ employees. If you have a potential candidate that is slightly smaller, please contact us. How is the Specific and Aggregate determined? The Specific is predetermined at a level the employer is comfortable with, and is usually based on group size. Some brokers suggest a multiple per employee, such as $100. In a 100-person group this translates to a $10,000 Specific and can be adjusted from there. The Aggregate is calculated actuarially by the company offering the insurance protection. They take into account the employee census, location, any known pre-existing considerations and then add a buffer for their own profitability. Does the employee notice a difference in their plan deductible or coinsurance? The short answer is, “No”. Their plan documents will tell them the plan is self-funded, but unless an employer wants to change benefits the employees can have the same benefits they enjoy now. Another benefit of a self-funded plan, however, is that benefit design can be very flexible - and these plans can cross state lines. (Self-funded plans fall under federal ERISA regulations, not state insurance commissions, making this possible.) This means an employer with multiple locations can offer the same plan and benefits to all, or tailor benefits based on locale, and still have everyone fall within the same self-funded plan umbrella. This is especially advantageous for employers with multiple locations. Take advantage of it! If the premiums for a self-funded plan are lower than a fully insured plan, how do I get paid? Is my commission still based on a percent of premiums? With many TPAs you’d be right in assuming your commissions would be hurt by going to a self-funded plan with lower premiums. But MBA pays you per employee, typically $25 but you can request what you need within reason. On a 100-person group you’d make $2,500, which is in line with a fully insured commission on a group this size. And remember, the larger group market is your open door to other sales for other product lines currently offered by you or your agency! What happens if the amount of claims coming in (before the bank is built up) exceeds the amount of claims monies available? This is actually an unusual scenario because of the “run-out” or “run-off” claims the prior carrier is still responsible for. (See Illustrated Example) The fully insured carrier from the previous year is still responsible for all claims incurred in that year, even if it takes several months for them to be adjudicated and paid. This lowers the liability exposure for the employer in the first few months of the new self-funded plan year. If this is still a concern to potential employer clients, insurance can be added to the fixed cost portion of the self-funded plan to cover claims over a bank’s assets for the first few months of the year. This only adds a buck or two per employee to the fixed costs. The question of “run-out” claims raises an important distinction within self-funded plans that brokers need to be aware of. As we know, claims incurred during a plan year are still paid by the insurance company into the following year under a fully insured plan. But contracts for self-funded plans are a little more specific when it comes to “incurred” and “paid” exposure. Typically many brokers will present a 12/12 contract in the quote for the first year of a self-funded plan, meaning claims incurred in the 12 months of the plan need to be paid within the 12 months. That leaves a lot of room for run-out claims exposure after the end of the year. You can request as 12/15 contract, which means claims incurred in the first 12 months have an extra 3 months into a new year to be paid. So even if the employer leaves the self-funded plan in the second year that employer is protected. A 12/12 contract is less expensive, but a 12/15 might be the plan to present if an employer is self-funding savvy or concerned about run-off. Likewise, if you are taking over a self-funded plan you need to be concerned about an employer’s current contract. 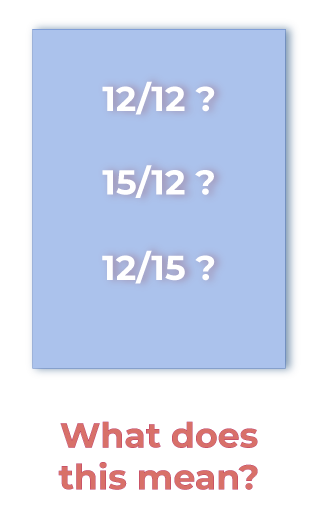 If the employer currently has a 12/12 or 15/12 contract you need to be concerned about run-out claims going into your new plan year. You will likely need a 15/12 contract. This pays claims incurred 3 months prior to the beginning of the new plan and year, leaving no gaps in payment. This may also be a good contract to consider in the second year of self-funding when you yourself offer the renewal. SALES TIP! If you are in a competitive situation with another self-funded plan, and especially if this is the employer’s first year in self-funding, ask to see the competitor’s quote and bring up the likelihood that this is a 12/12 contract. Raise doubt in the employer’s mind about its suitability due to possible liability for the next year. Then present both a 12/12 and 12/15 contract from MBA; an “apples to apples” and “one deal better” comparison. With MBA your 12/15 contract will still likely be lower than a competitive 12/12 contract and you will have set yourself apart as a trusted advisor who is looking out for the employer’s best interests! The potential for employers to save money is very real. An employer’s liability and expenses are capped. Monies not used for claims remain with the employer, not an insurance company. Employees see no difference in benefits unless the employer wants otherwise. Benefit design is very flexible. Self-funded plans work well for employers with multiple locations, even across state lines. Renewals with MBA, for reasons we’ll cover coming up, are generally flat or decrease. Brokers are well taken care of by MBA. Commissions are typically based on a per employee dollar amount. How to overcome the myths, lies and heresies you may hear about self-funding. As in every product line, you will run into competition in the larger group market. If a competing broker is unfamiliar with self-funding or is captive to a fully insured company, you may hear him or her disparage your quotes and broadcast a lot of misinformation. At the same time employers may have questions you need to know how to answer. This lesson sets the record straight and gives you the knowledgeable advantage. You’ll be able to answer every objection with fact! Getting to Know MBA Benefit Administrators. Does is matter which third party administrator administers a self-funded plan? Don’t they all do the same things? All TPAs offer claims adjudication. But MBA’s secret weapon is in how those claims are handled; how they can cut employer’s claims expenses and how this has a big impact on renewals the following year. These practices allow MBA to repeatedly offer renewals below current year costs and is a big reason the average client stays with MBA for 12 years...unheard of in the health insurance market. That’s good for employers - AND YOU! If you haven’t already, begin building a list of businesses to call for health insurance renewals and quotes. A whiteboard presentation presented by Phyllis Merrill, CEO of MBA Benefit Administrators. It is a recap of what we just covered, presented in front of employers. HIPAA Compliance Training: Regulations within the Health Information Portability and Accountability Act are a big deal and you will constantly run into HIPAA in the larger group market. We offer HIPAA compliance training to protect you and us. Each of the two 15-minute videos includes a 10-question quiz you must pass to sell for MBA.